The Quad Cities River Bandits, in conjunction with the Houston Astros, announced their opening day roster on Wednesday evening. The roster is bolstered by 15 members of the Astros 2018 draft class, including six of the top ten picks made by the organization. Nine players who were part of the River Bandits 2018 playoff roster will return to the Quad Cities for the start of the campaign where they will be joined by 15 members of the 2018 New York-Penn League champion Tri-city ValleyCats. Five of the position players who were drafted last summer have already suited up for the River Bandits. Catcher Cesar Salazar, infielders Trey Dawson, David Hensley and Scott Schreiber and outfielder Marty Costes each played at least 12 games in a River Bandits uniform last season. Schreiber, drafted in the 9th round out of Nebraska, blasted six home runs in his 60-game stint in the Quad Cities. A 22nd round selection from Maryland, Costes was a staple at the top of the order during the second half of the 2018 campaign. He was hit by 15 pitches and stole 8 bases over 49 games. Hensley, a 26th round choice from San Diego State, closed the regular season with multiple hits in four of his final seven games. The other returning position player is outfielder Jonathan Lacroix who raised his average from .198 to .256 in the final two months of the season. Two notable newcomers to the Quad Cities include shortstop Jeremy Pena and outfielder Ross Adolph. Pena is the highest drafted player on the initial roster, having been selected in the 3rd round last summer out of Maine. In 36 games with Tri-City last season, he posted a .250 batting average and showed tremendous plate discipline by walking 18 times against just 19 strikeouts. Adolph was acquired from the New York Mets in a January trade that sent J.D. Davis and former River Bandit Cody Bohanek to New York. The native of Findlay, Ohio was drafted in the 12th round by the Mets out of Toledo and made his pro debut with their short-season affiliate in Brooklyn. Adolph was named the New York-Penn League All-Star Game MVP and finished in the league's top ten in runs scored, triples, home runs, total bases, stolen bases and slugging percentage. The pitching staff will feature three familiar faces from the 2018 group that demolished the previous Minor League Baseball record for strikeouts in a single season. Right-handers Humberto Castellanos, Willy Collado and Luis Garcia will all open the campaign in the Quad Cities. Castellanos finished with a 2.09 earned run average in 21 relief appearances last season. Collado was nearly unhittable at times, collecting 54 strikeouts in 40.1 innings on the mound. 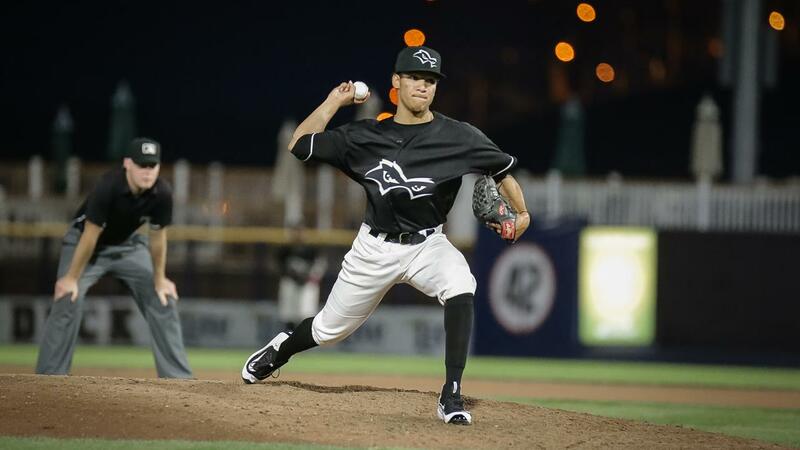 Garcia made 19 appearances, including 10 starts and went 7-2 with a 2.00 ERA for the Bandits. The remainder of the pitching staff moves up a level from Tri-city where they combined to lead the New York-Penn League in strikeouts last year, averaging just shy of 10 per game. One of those newcomers is 2018 8th round draft choice Austin Hansen from Oklahoma. Following the draft, the right-hander pitched in 14 games with the ValleyCats and held the opposition to a .130 batting average while striking out 45 in 30.2 innings. He was chosen to represent the ValleyCats in the NYPL All-Star Game. Brett Conine, Brett Daniels and R.J. Freure were also selected in the first 17 rounds of the draft and held opponents to a batting average lower than .200 with more strikeouts than innings pitched last year. First year manager Ray Hernandez will have a roster featuring plenty of college experience to draw upon. Fourteen players were drafted from a Division 1 baseball program. Pena (#27) and Adolph (#30) were both ranked in MLB Pipeline's list of the Top 30 prospects in the Astros farm system. The River Bandits will open their 2019 season on Thursday, April 4 by hosting the Burlington Bees at 6:35 p.m. For more information, call (563) 324-3000 or visit the Modern Woodmen Park between 9:00 a.m.- 5:00 p.m. Monday-Friday.